Saturday for lunch I found myself downtown running a few errands here and there. Shortly after 11 I was heading towards Shoppers Drug Mart and Loblaws on Rideau Street. Before shopping, I thought I would stop off at a place that had intrigued me for some time but never got around to visiting, Smoke's Poutinerie (407 Dalhousie Street, Ottawa). Tucked away on the southern leg of Dalhousie Street (that ends 1 block south of Rideau Street near Besserer Street) off main Rideau Street, this restaurant is almost hidden. Add in being located where OC Transpo has a lay up area for their buses that begin and end at the nearby Rideau Centre stop and this storefront can be a little difficult to find for the average passing person. Luckily, the nearby University of Ottawa campus and two major downtown hotels (Les Suites and Novotel) provide a decent sized clientele that both are geographically close (university and hotels) and in the right target market (university students). I entered shortly after 11 a.m. to be met by one customer who had just finished ordering and the employee who immediately asked what I wished to order. I politely, with a smile on my face, said "order? I just got here and need to see the menu" He smiled and said he would start preparing the other order and to let him know when I was ready. I perused the overhead menu going over the extensive options of poutine. Everything from just fries, to regular poutine, to beef, steak, chicken and pork variations are available. After making my choice I waited for the employee to make eye contact and signal I was ready. The Order: 1 Nacho Grande with a Coke. Next came the interesting wait of anticipation. One employee and, after three minutes, another three customers came in. Great! Things seemed to be picking up for Saturday lunch, yet the single employee had to take orders, scurry around to the kitchen, make orders and bring them back up. It really did seem this location was understaffed. After a ten minute wait, things started moving. First up the first customer received her order. With a line up of receipts on the counter put there in order of arrival, the employee scurried through each one with the only question being "for here or to go?" With each reply the orders were either bagged up to fly out the door or handed over to salivating customers like me. My order came up with a "Nacho Grande with Coke" and I was handed the nachos. I stopped and waited, next order was called. Um... where's the Coke? After the next order was dispatched the employee looked sheepishly at me and then went and grabbed it out of the fridge. The wait was decent for what should be considered "fast food". But was it worth it? Presentation wise it was one of the better looking fast food style plates I'd seen in a long time. But taste wise would it hold up? I dug into the Nachos Grande with the required and duly issued fork. The fries were thin supposedly handcut fries mixed in with all the usual toppings nachos would have including ground beef, jalapeno peppers, salsa and artfully drizzled sour cream. With a touch of a spicy kick, you'd think you were enjoying a favourite plate of the mexican version sans le nachos chips. The only other thing I thought was missing, besides the nacho chips, was a little cheese. Perhaps that could be an add on option in the future. Other than that, the nachos plus fries were delish! Yes the fries stood up as, even fifteen minutes later, didn't suffer of over sogginess caused by all the other moist offerings coagulating together. 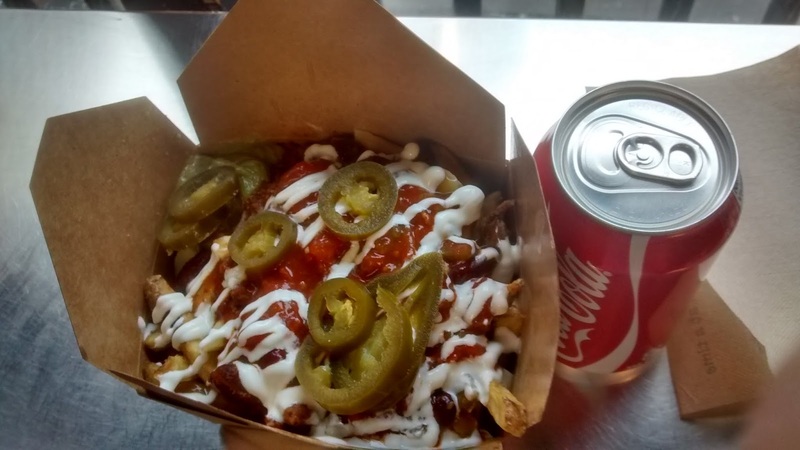 Overall, Smoke's Poutinerie is an interesting addition to the Ottawa restaurant scene imported from Toronto. With several well thought out variations of the mainly Canadian dish of Poutine, this restaurant is decent see. With the price bordering around $10.00 but decent portions provided there is some value here as well. Tucked in on a somewhat side street, the location is a little hidden from the usual passing tourists and whoever walks by on Rideau Street. But this place seems to have a following as even on Saturday lunch a steady stream of hungry customers arrived. Smoke's may be the new favourite place on our list of downtown locales when in search of a bite to eat.